“The Wave” (“Bolgen”, 2015), is a tsunami disaster rescue film set in a Norwegian fjord directed by Roar Uthaug. It warns about what could happen at several locations in Norway at any time, and starts by documenting a deadly 1905 disaster, where a rockslide created a local 300-foot tsunami. The location is the Akneset fjord and the resort town of Geiranger (said to be the site of the earlier disaster). A geologist, Kristian (Kristoffer Joner) and his family are planning to move to a bigger town for him to take promotion. But for some years he has supervised a work crew, actually housed in civilian barracks, that watches instruments warning of earthquakes and rockslides. They even go on even hikes (I call them “night-hikes”) and rappel into a gorge, very physical work. The scene resembles one in a famous 50s horror film set on a mountain (“The Crawling Eye”). Despite all the technology, it seems that a sudden catastrophe is very hard to anticipate. It happens while Kristian is out, and teenage son Sondre (Jonas Hoff Oftebro) is skateboarding in the basement of the resort hotel, with Walkman, unable to hear the sirens. The catastrophe comes half way through the film, and much of the rest of the film concerns the family’s saving itself from drowning in a bomb shelter. The film was Norway’s submission for best foreign language film. The official site is here (Magnolia Pictures). I’ve covered some other films involving tsunamis on my “Films on Major Challenges to Freedom” blog under the label “tsunami”. These include “The Impossible” (Dec. 21, 2012), about the 2004 tsunami in the Indian Ocean, and the 1977 film “The Last Wave”, set in Australia, by Peter Weir, discussed Oct. 25 2011, where a tsunami is predicted by aborigine lore. One of the biggest but little known threats to the US East Coast can come from the Cumbre Vieja volcano in the Canary Islands; if it sustained a landslide, a several-hundred-foot tsunami could hit the US East Coast 12 hours later. I spent a week in Norway at the end of July 1972, visiting Oslo, Bergen, Trondheim and Narvik (and then Kiruna Sweden). I saw the film Friday night, early, at Landmark E Street in Washington, before a nearly sold-out smaller auditorium. The audience, mostly young adult, seemed to like the movie. 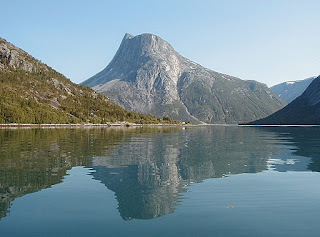 Wikipedia attribution link for picture of Sjjomen Fjord, by Knutsandvik, under CCSA 3.0 license.